Preface: Cubberley Auditorium at Stanford School of Education was packed with many standing in the aisles. Prof. John Bender Director of Stanford Humanities Center gave a brief introduction to the Harry Camp Lectures & Seminars. Then Prof. Seth Lerer of Stanford's English & Comparative Literature Departments gave a humorous introduction to Elaine Pagels "More than anyone, Elaine Pagels has introduced us to early Christianity. The virtue is not just in her book but in her life. When I was in my 20's, there was no religion in my life. There were lots of human psychology to explore, but is it for me? We learn from the praise of others. What could I have in common with Elaine Pagels? I taught at Princeton but never met her there. 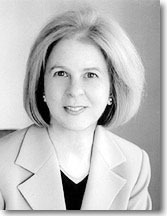 I do have a book published by Princeton University Press and Elaine Pagels is teaching at Princeton. I googled myself and found 881 web pages on Seth Lerer and 31,000 web pages on Elaine Pagels. At Amazon. com, I was happy to find that 'customers who bought titles by Seth Lerer also bought titles by Elaine Pagels'. While my book ranked 846,000 in sales [Lerer, Chaucer and His Readers (600,158) and Error and the Academic Self (838,567)], Pagels' books are among the most popular in the top 100's [Gnostic Gospels (74), Adam, Eve, and the Serpent (1324), Origin of Satan (628), Beyond Belief (305)]. 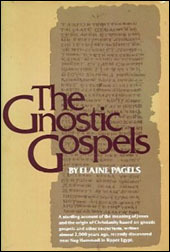 Elaine Pagels' work shows original synthesis of the "Dead Sea Scrolls" and "Nag Hammadi" texts. Her work grows out of personal tension of scholarship. She delves into the politics and piety in everyday life. She examines the kind of Christianity that separates good & evil, the saved & damned, the intricate relationship between early Christianity and Judaism. She tells me that she has a broken ankle, but I'm sure her lecture will illumine us all." Prof. Lerer's self-deprecating humor brought lots of laughter from the audience. Elaine Pagels then walked slowly onstage with her crutches, saying that she has a broken ankle but it's healing. Then she put her crutches aside by the podium and launched into her lecture. Waving her arms and gesturning for emphasis, she compared the Gospel of John with the Gospel of Thomas. While Thomas tells that we are all children of God and can experience the transcendent directly, John was emphatic that Jesus is "the only son of God" and only through Jesus can we enter the Kingdom of Heaven. To discredit Thomas, John portrayed him as the "Doubting Thomas" in his Gospel, and as the only one who was absent at Christ's resurrection. It was a real eye-opener that Elaine Pagels compared the two texts side by side, bringing out the intense struggle of early Christianity. I felt that Pagels was toppling the foundations of Christianity with her insightful discoveries. After her lecture, I was walking with my friends to the parking lot when we chanced upon Prof. Bender and Elaine Pagels in front of the Cubberley Building. I went up to Elaine and told her how much I enjoyed her tour de force lecture. The Gospel of John was my favorite among the Four Gospels and now I have to re-read it for its bias. 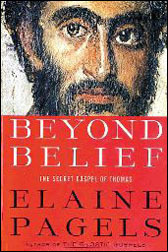 Elaine told me to read Chapter 4 of her Beyond Belief that shows why John was included in the canonical texts and Thomas left out. The last time Elaine Pagels lectured at Stanford ("The Origin of Satan" 1996), I was inspired to write a poem about the experience. Elaine told me that she would like to read it. It took me a few days going through some 500 floppy disks before I found it "From Pagels to Pegasus". Meanwhile here are my notes of Elaine's lecture. I wish to share with you this archaelogical discovery looking for the Golden Age in graduate school play Bible Land as my professor called it. My professor [Krister Stendhal] had lots of books on his shelf that I've never read. They were discovered in Nag Hammadi, Egypt, in 1945 in a sealed jar by a peasant. The scrolls were written originally in Greek, but found in Coptic, a language spoken in Egypt some 16 centuries ago. The Gnostic Gospels consists of these 50 ancient Christian writings, among them was The Gospel of Thomas. What do these texts mean? Athanasius, the Bishop of Alexandria, got rid of the secret Gnostic texts in 367 A.D. and saved 27 books which became the Nedw Testament. One of the monks buried the 50 texts. Irenaeus from rural Gaul declared that only four texts were genuine Matthew, Luke, Mark, and John. They symbolized the 4 corners of the universe, the 4 winds, the 4 seasons. These were written by the disciples of Jesus. But so were the ones written in the Nag Hammadi scrolls. The Gospel of Thomas was published in 1959. The scholars dealt with heresy as a matter of choice in selecting the canonical texts. But the Church regarded heresy as false doctrines. Mark wrote 40 years after Jesus died. Luke and Matthew 50-60 years later, and John 70 years later. Irenaeus wrote five volumes Against the Heretics, defining heresy as dualism, nihilism, bizarre mythology, philosophy. Compare Thomas to Matthew and Luke "Blessed are the poor in spirit" (Matthew) & "Blessed are your poor" (Thomas). My professor said the Thomas text dated 20 years after Jesus died. I say that's wishful thinking. Prof. Bender told the audience that there will be a two-hour Discussion Session of Pagels' lecture at Stanford's Humanities Center tomorrow from 4-6 pm. But Elaine was gracious to take some questions from the audience in case some couldn't make it to tomorrow's discussion. Thomas: "Teacher, my mouth is utterly unable to say what you are like." "I am Theos (divine). You are Theos (divine). I am you." Q: What does the Fall of Man play out in the Four Gospels? A: It's a really good question. In John, the world can't be saved except for Jesus. In Thomas, it's going back to the primordial state. "Who are you mister? You have climbed onto my couch." Jesus said: "I am the one who is undivided." male and female created he them"
When someone asks me "Are you a Christian?" I say "What do you mean by Christian." The questioner will say "Do you believe Jesus is your Savior?" The five trees may also be related to the Kabbala. Q: Rodney Stark would say that there are no early Christian Gnostics. Gnostics are derivatives of early Christians. A: Bart Ehrman's Lost Christianities deals with proto-orthodox gnostics. I don't call the Gospel of Thomas a gnostic text anymore. Krister Stendhal thought that these texts were weird. which were more authentic than the others. I'm contrasting John of the Cross, T. S. Eliot found John a mystical text. Q: Is this a prologue of Thomas? A: This is the whole thing the 114 sayings is the complete Gospel of Thomas. By finding and struggling. This is a process of search and surprise. Thomas 2: "When they find, they will be disturbed. When they are disturbed, they will marvel." Thomas's teaching is more advanced. Q: What does the Gospel of Thomas say about the infant Jesus? A: Jesus going to the Temple and made a clay bird come to life. And the sparrows flew off chirping." Also: "I have come to you with a sign from your Lord. that John wrote and Thomas wrote as if addressing each other. A: We don't know who wrote these texts. This is what my teacher taught. and Thomas texts were available in the 1st century A.D. The Book of Matthew is the teaching according to Matthew.  What would Christianity be like if gnostic texts had made it into the Bible?